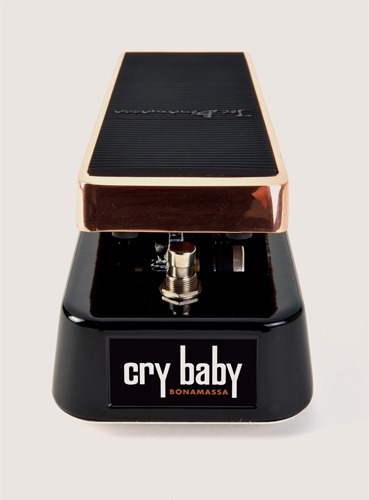 DEERFIELD BEACH, Fla., Dec. 6, 2011 /PRNewswire/ — Guitar-rock sensation Joe Bonamassa releases the Joe Bonamassa Signature Cry Baby in conjunction with Dunlop, a leading manufacturer of electronic effects, picks, capos, slides, strings and other musical instrument accessories. This new pedal comes on the heels of the previous Dunlop-Joe Bonamassa pedal which received rave reviews. Whether it’s with his bluesy solo career or with the rocking Black Country Communion, Bonamassa’s playing is fiery, deep, and powerful. And when he really wants to express himself in a solo, he steps on a Cry Baby wah. That’s why the folks at Dunlop worked with Joe to develop the signature pedal, specially engineered to fit in perfectly with Bonamassa’s tone. The pedal can be purchased exclusively on Bonamassa’s website. Each pedal comes with a free Bonamassa Cry Baby Shirt. On the outside, the pedal sports a classy copper top with a smooth-finish black body. On the inside, it features large, vintage-style thru-hole components, a Halo inductor (for added harmonic content), an output buffer (to prevent impedance imbalance with vintage fuzz pedals), and a switch for true-bypass or non-true-bypass operation. With its huge vocal sweep range, this is one of the most expressive Cry Babys ever and it’s Bonamassa’s tool of choice to accentuate every soulful bend and bluesy wail. Bonamassa’s popularity has been steadily rising with no end in sight. He was named 2010’s #1 Billboard Blues Artist with most recent album Dust Bowl (J&R Adventures) debuting at #1 on the Billboard Blues Chart and #37 on Billboard’s Top 200 Chart, making it his highest-selling and chart-ranking U.S. debut to date. His side project, hard rock band Black Country Communion – with bandmates Glenn Hughes, Jason Bonham and Derek Sherinian – was named “Best New Band of the Last 10 Years” by VH1 Classic’s That Metal Show. He just collaborated on an album of soul covers called Don’t Explain (J&R Adventures) with one of music’s most powerful female voices – singer-songwriter Beth Hart. After the enormous success of his 2009 sold-out concert at London’s Royal Albert Hall – which included a career-changing duet with Eric Clapton – and subsequent live DVD release, Bonamassa filmed his two recent sold-out shows (Nov. 4-5) at NYC’s famed Beacon Theatre. Special guests at the shows included John Hiatt, Paul Rodgers and Beth Hart. The live concert DVD and PBS special capturing the magic of both nights will be released in early 2012.